Beneranda stands in the doorway of her new home. Beneranda’s new home is nestled in the lush green landscape of Nicaragua. If home is where the heart is, Beneranda’s home has always been the small patch of Nicaraguan farmland she inherited from her father. But for most of her adult life, it was a home without a house. Beneranda is 57 years old and lives with her husband, William, and their two youngest sons in a sturdy cinderblock home on their own land. For many years it wasn’t that way. Because they couldn’t always afford the seed and equipment for full-time farming, the family stayed in a nearby town and took whatever work was available to them. These odd jobs were sporadic and didn’t pay well. Sometimes they didn’t pay at all. Whenever she could, Beneranda would go home to work on the farm, but the need for income always took her back to town. Then one day, just before harvest time, she arrived at home to discover that her entire corn crop had been stolen. She knew then she had to make a permanent move. The family set up a make-shift tent on the farm and dedicated themselves to working the land full time. These were hard days and the simple tent did little to protect them from frequent flooding from the nearby stream and other adverse conditions. Beneranda’s son Franklin stands in front of the family’s previous home, which only had plastic sheets to shield them from the environment. Beneranda remembers praying to St. Joseph, the patron of new homes, for whom she has a special devotion. She believes that her prayer was answered and that the angel who delivered the good news was Jose Esteban, a social worker in Unbound’s Managua program. Franklin, Beneranda’s 14-year-old son, is sponsored through Unbound. 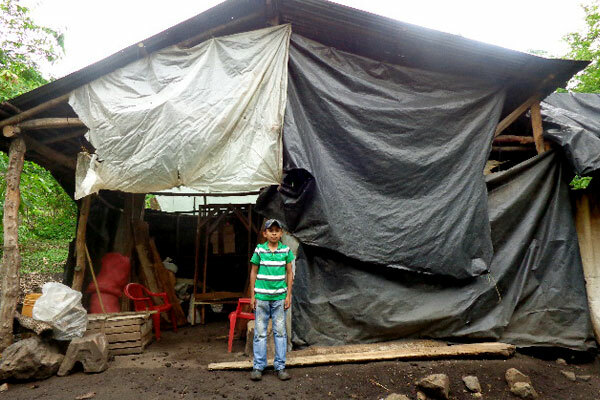 Jose came to let the family know that the boy was to receive a financial benefit, through the generosity of his sponsor and monies available through Unbound’s home-building initiatives that would help them build a permanent dwelling. Constructing the new home was a challenge. The land was rugged and only accessible by foot. It was then that Beneranda’s other “angels” stepped up. Families walked 35 minutes uphill carrying building materials to help construct the family’s new home. Sponsored children and their families joined together to help Beneranda and her family so they could have a safe place to call home. Today Beneranda’s days are marked by joy and gratitude. She and her family still struggle to raise their crops, but they know that each hard day will end with rest in their own home on their own land. Beneranda is content. Want to help someone like Beneranda and her family? Sponsor a child today or donate to Homes. The mighty blessings of God are everywhere and unstoppable. In the name of God, all things are possible. How moving it is to read of miracles and answered prayers in the lives of those who need it most. This makes me appreciate what God has given me. Inspiring story.